Occasionally we come across applications that are so plagued with interface design problems that they beg an in-depth critique. We're not sure whether the problems arise through ignorance of the principles of proper design, or result from an arrogant disdain for the same principles. Whatever the basis for these problems, these examples provide a wealth of information as to how applications should NOT be designed. ReadPlease 2000 is a potentially useful text-to-speech software application designed to look like a Palm Pilot. The usefulness of the application however, is almost entirely negated by the gratuitous application of a completely inappropriate metaphor. Amid much fanfare, Apple recently released a beta version of QuickTime 4.0. In addition to a variety of technological improvements over previous versions, QuickTime 4.0 sports a completely redesigned user interface, one that represents an almost violent departure from the long established standards that have been the hallmark of Apple software. Ease of Use has always been paramount to Apple, but after exploring QuickTime 4.0, the rationale behind Apple's recent "Think Different" advertising campaign is now crystal clear. We wish we found IBM's Lotus Notes a long time ago. This single application could have formed the basis for the entire site. The interface is so problematic, that one might conclude that the designers had previously visited this site, and misread "Hall of Shame" as "Hall of Fame". A regular visitor to the site pointed us to the shareware strategy game, Pirates: Quest for the Seas. The program offers a number of important lessons for the user interface designer, including tips on how to spot a GUI designed by someone without GUI design experience. 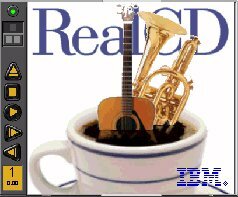 IBM's RealCD represents a new philosophy in interface design. We invite you to try it out, share your impressions, and see whether or not it represents the "state of the art" as IBM claims. (OK, the fact that it's in this category might be a clue...). In Windows95, there is perhaps no better example of how applications should not be designed than the Find Applet. Its combination of confusing structure, inconsistency both within itself and with the rest of Windows95, and overall disorganization highlight it as a true embarrassment to Microsoft. We were more than a little curious when the early reviews of Windows95 referred to the Explorer essentially as "something you will eventually get used to." Since Explorer is one of the core components of Windows95, we felt it was important to identify some of the many interface problems associated with it. The Windows95 common file dialogs (Open File, Save File, Run) offer further proof that proper interface design is no longer a concern at Microsoft. We are at a loss to explain what the designers were thinking when they came up with these dialogs. What we do know however, is every time a new user is presented the Windows95 common file dialog, he or she is at a loss as to what the heck is going on. IBM's RealPhone is purported to be an experiment in user interface design. We regard it as a complete failure in interface design, and an embarrassment to the entire interface design profession. We examine the many interface design problems, and attempt to highlight why "real-world" metaphors rarely succeed in interface design. trueSpace2 is an extremely powerful 3D graphics tool that will allow you to create stunning images and visual effects. Unfortunately, to achieve this power, the designers have literally turned interface design on its head, resulting in an interface that will absolutely confound the user. Whereas the properly designed interface is almost invisible to the user, trueSpace2 users will find themselves stumbling over the interface. you can view this file in its original layout: target.htm.